Forum | PolishOrigins :: View topic - Polish surname after death of first spouse? Polish surname after death of first spouse? Posted: Tue May 17, 2016 3:31 pm	Post subject: Polish surname after death of first spouse? My maternal grandfather's family were from the Podhale (Podczerwone and Wróblówka) 1800's. Króżel are related. The problem is that either my grandfather's mother, or one of his great-grandmother's were widowed from a first husband and then remarried. Would this woman revert back to her (nee-maiden) name after the death of her first husband, prior to remarriage, OR, would she keep her married name at the time of remarriage, and take her 2nd husbands name at that time? What name would the church records for marriage reflect the second time around? 3 children together--one of them my grandfather. However, I believe Rosalia was earlier married (to a Bobek?) who died, if I remember the story. 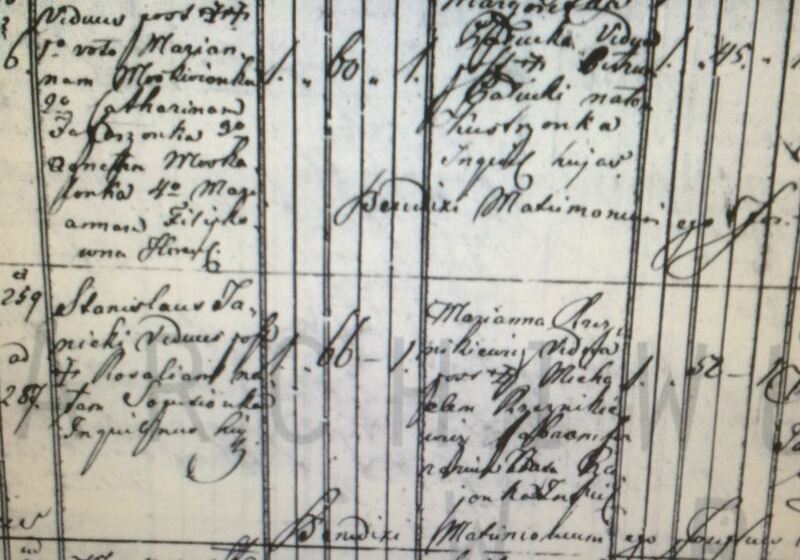 (everyone associated is gone now..) I think I have found this record (the first marriage via Czarny Dunajec church records from Wroblowka), but not the 2nd. Unfortunately, I do not have my grandfather's baptismal certificate, but believe he was born January 19, 1893, most likely in Podczerwone or Wroblowka per his marriage record. Does anyone know which surname would be on Rosalia's marriage records for the 2nd marriage to my great-grandfather or great-great-grandfather? Thank you. Any church documents from this area with any of the above names, would be appreciated if anyone has them to share. The records from 1800's Czarny Dunajec area are not yet searchable online. BRIDE: 1. She is “panna” (Miss), unmarried. 2. Her name is her parents name (almost always her father name, but few cases out of wedlock, then mother’s name). 3. Quite often the grammatical rule of Polish language is used to stress out the status of unmarried young woman, such as the most common suffix -ówna, example: father Krozel, daughter Krozelówna. BRIDE-PARENTS: The name of bride’s parents, given on the marriage record, does match the bride’s name. IMPORTANT: "match" taking into account Polish grammar, i.e. suffixes, gender and declension. BRIDE: 1. No word “panna” (Miss). 2. Her name is her husband name (sometimes the birth name might be given too), it is explicitly stated she is widow of her deceased husband, with his death date. 3. In some cases the grammatical rule of Polish language is used to stress out the status of married woman, such as the most common suffix -owa, example: husband Kowalczyk, his wife Kowalczykowa. BRIDE-PARENTS: The name of bride’s parents, given on the marriage record, does not match the bride’s name. In case when BRIDE’s name does not match BRIDE-PARENTS’s name, you have to iterate until you find both names as in the case MARRIAGE1. I married in France, where the rule is: your birth name NEVER disappears, it is always: born NAME1, spouse NAME2 etc. When I updated my Polish passport, my birth name disappeared, the only name was my husband name. I ended up with the situation, when the only document showing my birth name in Poland was a French one (I desperately needed it in some cases). To add to what Elzbieta wrote...Since you mention that your ancestors were from Podhale the records, as I'm sure you know from those you've seen, were kept in Latin. The attachment is an example to two marriages between widowers and widows which earlier had been posted for translation. The handwriting is not the best, but perhaps you can use those entries as a guide. The record you are searching for may not be exactly like those two but most entries for second marriages should be similar. As Elzbieta mentioned, the widow's surname is first entered as her married name from her first marriage. It is usually explicitly stated that she is a widow (vidua). The name of her late husband is entered, with or without the date of his death. There are a number of ways the deceased husband's name can be entered. Here it is "post +" but it could also be entered as "post def." or "p.d. ", etc. followed by his surname. The bride's maiden name is usually also entered. Probably the most common way in which her maiden name is found is that it appears after the word "nata" (literally: "born"). In these two records the maiden names appear with the suffix -ka and -onka. As an aside, both grooms were widowers. For the second entry the late wife's name is entered after the expression "post +" but the first entry is a bit more complicated in that the widower had been married four times. The names of his first four wives are found after the expressions "post +" followed by 1o voto (primero voto or literally from the first (marriage) vow) the other three are just given numbers (2o, 3o, 4o/secundo,tertio, quarto/second, third, fourth and voto/vow is left understood). It is good to show examples. Posted: Wed May 18, 2016 6:50 pm	Post subject: Polish surname after death of first spouse? Thank you very much for your response, stories and examples. This will be extremely helpful in my search efforts!